HOUSING: Transitional Housing Program participants reside in a room in a 74-room converted hotel. Families are kept intact and are assigned a secure, comfortable unit upon acceptance into the program. Rooms come furnished and include a full-sized refrigerator, microwave, and crock pot. On-site laundry facilities are provided for $1 per load. KITCHEN: There is a large shared-use kitchen. The space consists of four stoves and ovens, cookware, and six dining room tables with chairs so that residents can prepare and serve meals to their families. The kitchen is also used for cooking instruction and for smaller meetings. NURSERY: Restoration’s Nursery facility provides on-site supervision of resident children while the parents are participating in “on-site” program activities. The 520 square foot space comfortably houses the toys and equipment needed for birth through age five.School age children are required to attend public schools. Assistance is provided in getting bus transportation arranged for pick up and delivery at Restoration. FOOD PANTRY:Our 1,700 square foot Food Pantry, adjacent to our Clothing Pantry, stores food for distribution to those in need in our community. In addition to numerous shelving units, this facility boasts of 13 freezers, a 3-door cooler, and a 650 cubic foot walk-in cooler. CLOTHING PANTRY: Our 1,200 square foot Clothing Pantry is located at the west end of the Administrative Building. Donated clothing is sorted and displayed for free distribution to our residents and community members in need. Seasonal clothing in child through adult sizes is available on a first-come, first-serve basis. CLASSROOM: A large classroom is located just off the multipurpose room in our Main Building with desks and chairs for 40 people. This space is used for self-sufficiency classes, recovery group sessions, Bible study and other meetings. TEEN CENTER: A teen center is made available to teenaged residents during supervised hours. This space will include a refreshment area, arcade games, comfortable seating, and a wall-mounted television. 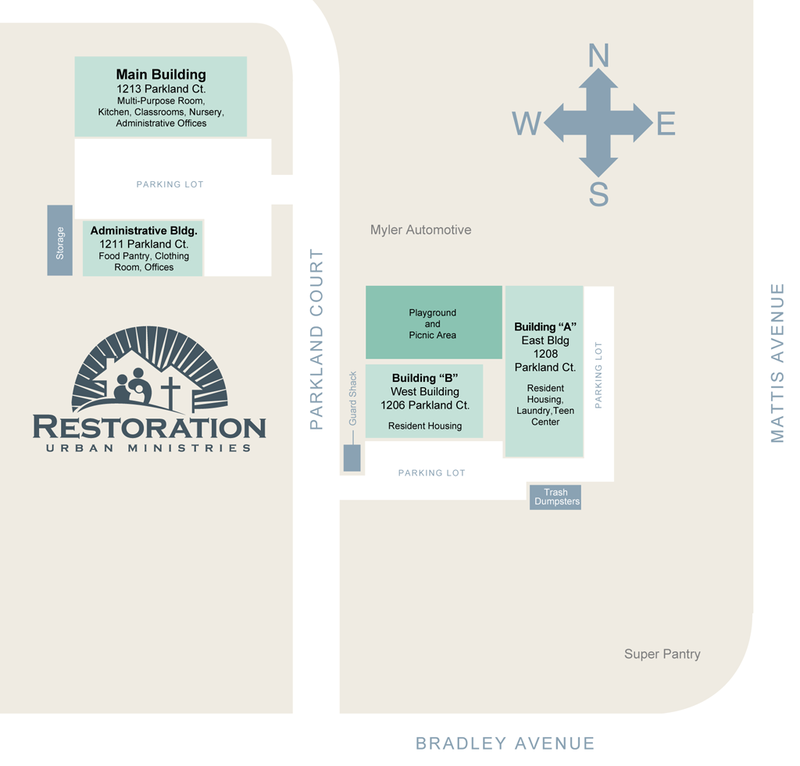 MULTI-PURPOSE ROOM/SANCTUARY: A 2,400 square foot multi-purpose room houses Restoration Church each Sunday morning and provides space for concerts, community distribution events, and sit-down dinners for residents and staff. PLAYGROUND: There is an area including a wooden playground structure that provides exercise and entertainment to our youngest residents. The mulched site is conveniently located next to the Resident Inn and includes climbing equipment, a slide, swings, and a sheltered picnic area. A basketball hoop is nearby. OFFICES: Restoration’s offices are located in both the Main Building and the Administrative Building.